A large amount of New York City’s public space is the streets. Most of the time, pedestrians have limited to no access to this vehicle-dominated space. However, this summer, miles of streets will be dedicated to pedestrian activities on the weekends. Polly Trottenberg, NYC Department of Transportation commissioner, said, “I’m excited to announce, after what I have to say was a long, cold, snowy, difficult winter, the continuation of three of the best events in the summer in New York City. The commissioner is referring to Summer Streets, Weekend Walks, and extended car free tours in Central Park. Summer Streets is three consecutive Saturdays in the summer when nearly seven miles of Manhattan’s streets are closed to cars and opened for people to play, run, walk, and bike. This year Summer Walk will take place on August 2, 9, and 16 from 7 a.m. to 1 p.m. The route begins from Central Park, and continues along Park Avenue continuing onto Lafayette Street all the way to the Brooklyn Bridge. There are several rest stops along this route that feature different activities. 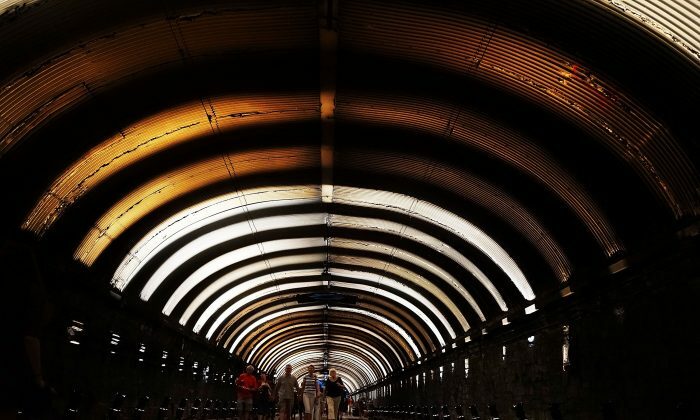 At the Park Avenue Tunnel, you can listen to a special sound installation called dive, which features sounds of the ocean. At the Midtown rest stop you can join in a picnic and play mini golf. At the Soho Rest Stop, you can rock climb. And at the Foley Square rest stop, you can even fly through the air on a 25-foot-high zip line. This is the seventh year that Summer Streets is held in the city. Last year, over 300,000 people attended. “When you’re out in the streets with no cars, you get to look at a lot of the icons buildings in New York with a whole new vista,” said Trottenberg. Weekend Walks is a similar activity, where roads are closed off for pedestrian activity, but it is hosted in all five boroughs at different times. A different local partner hosts each Weekend Walk activity. For example, Sunnyside Shines BID will host their fifth Weekend Walk on July 26 at 46th Street between Greenpoint Avenue and Queens Blvd. “Each year we invite local businesses and community organizations to help us transform our streets into true public spaces for the day, with musicians, hands on art projects, fitness activities, and games,” said Rachel Thieme, executive director at Sunnyside Shines BID. The walk can showcase art, music, and dance performances, workshops and food. During this time, participating local restaurants can all offer outdoor cafe service, where alcoholic drinks can be served. So if you want to enjoy a cocktail in the sun, look up the upcoming Weekend Walks in your area. In Manhattan, upcoming Weekend Walks include the Chinatown BID Family Festival on Mott Street between Canal and Worth Streets on June 28 from 1 p.m. to 5 p.m. The Chinatown Mid-Summer Festival will take place at the same location on July 13 and 20 at 11 a.m. to 5 p.m. Finally, both pedestrians and drivers should take heed that beginning June 27 through Labor Day, north-south drives in Central Park above 72nd Street will be open exclusively to pedestrians and bike riders. Bronx Summer Fest on the Boulevard: Louis NiÃ±e Boulevard between Southern Boulevard and Jennings Street; June 7 and 14, noon â€” 4 pm , June 21, 4 â€” 8pm (Saturdays). Hosted by WHEDco. Grand Street Block Party: Grand Street between Bushwick and Manhattan Avenues; June 21, 28 (Saturdays) at 2 pm â€” 8 pm. Hosted by Grand Street BID. Summer Stroll, 80th â€” 90th Streets: Third Avenue between Bay Ridge Avenue and 90th Street; July 18, 25, August 8, 15 (Fridays) at 6 pm â€” 10 pm. Hosted by Merchants of Third Avenue. Flatbush Junction Community Weekend: Flatbush Avenue between Glenwood and Farragut Avenues; July 13 (Sunday) at 2 pm â€” 7 pm. Hosted by Flatbush Nostrand Junction BID. South Slope Weekend Walks: Fifth Avenue between 12th and 18th Streets; July 18, 25 (Fridays) at 5 pm â€” 9 pm. Hosted by the Park Slope Fifth Avenue BID. Seventh Avenue Summer: Seventh Avenue between 9th and 16th Streets; July 19th, 26th (Saturdays) at Noon â€” 5 pm. Hosted by the Park Slope Civic Council. TAMA Summer Fest Weekend Walks III: Tompkins Avenue between Hancock Street and Putnam Avenue; July 26, August 2 (Saturdays) at 2:30 pm â€” 5:30 pm. Hosted by Bridge Street Development Corporation. North Slope Weekend Walks: Fifth Avenue between Sterling Place and Dean Street; August 15, 22 (Fridays) at 5 pm â€” 9 pm. Hosted by Park Slope Fifth Avenue BID. Weekend Walks Community Street Fair: 16th Avenue between 42nd and 45th Streets; August 24 (Sunday) at 11 am â€” 4 pm. Hosted by Borough Park Jewish Community Council. Southside Connex: Havemeyer Street between South 4th and Grand Streets; September 13, 20 (Saturdays) at Noon â€” 5 pm. Hosted by El Puente. Summer Stroll, 69th-80th Streets: Third Avenue between 69th Street and 80th Street; August 9, August 16 (Fridays) at 6:00 pmâ€”10:00 pm. Hosted byMerchants of Third Avenue. Chinatown BID Family Festival: Mott Street between Canal and Worth Streets; May 31, June 28 (Saturdays) at 1 pm â€” 5 pm. Hosted by the Chinatown Partnership. Positively 8th Street: West 8th Street between Fifth and Sixth Avenues; June 14, 21 (Saturdays) at noon â€” 5 pm. Hosted by the Village Alliance. Hamilton Heights-Sugar Hill 4th Annual Cultural Festival: Hamilton Place between West 142nd and Amsterdam Avenue; June 21, 28 (Saturdays) at 11 am â€” 5 pm. Hosted by Harlem One Stop. Explore China Town Mid-Summer Festival: Mott Street from Canal to Worth Streets; July 13, 20 (Sundays) at 11 am to 4 pm. Hosted by the Chinatown Partnership. Bloomingdale Family Days: Amsterdam Avenue between West 106th and 110th Streets; September 7, 14, 21 (Sundays) at 11 am â€” 5 pm. Hosted by the Columbus Amsterdam BID. Sunnyside Strolls: 46th Street between Greenpoint Avenue and Queens Boulevard; July 26, August 2, 9, 16 (Saturdays) at 1 pm â€” 7 pm. Hosted by the Sunnyside Shines BID. Astoria Park Shore Fest: Shore Boulevard between Astoria Park South and Ditmars Boulevard; August 3, August 10, August 17 (Sundays) at 1 pm â€” 6:30 pm. Hosted by the Astoria Park Alliance. Bayside Village Sunday Stroll: Bell Boulevard between 39th and 41st Avenues; September 28 (Sunday) at noon â€” 5 pm. Hosted by the Bayside Village BID. Van Duzer Days: Van Duzer Street between Wright Street and Beach Street; July 12, July 19 (Saturdays) at noonâ€”7:00 pm. Hosted by Staten Island Collaboration (SIcoLAB). Sticky Situation NYC & Skatedown at Castletown: Castleton Avenue between Davis and Oakland Avenue; July 5, July 12 (Saturdays) at Noon â€” 5 pm. Hosted by the Castleton Collective. Summer Solstice 2014: When is the First Day of Summer This Year? Here are the five most interesting TV series that will begin in the U.S. this summer.